I've been working on making assessments for a few different courses, so naturally the first idea I had was a Jeopardy style review game. I came here to find some templates, but, not being a particularly masterful user, found them a bit obscure for me. Attached is the template I've created out of two of the others found on this board. It's pretty simple and self-explanatory. Please use this to your advantage, alter it in any way you'd like, and share any questions/feedback. Each question has its own correct and incorrect slides so you can add explainations/follow up, the text in the boxes on those slides now is a place holder. thought I'd add fully developed Jeopardy game. Alter everything about it to suit your needs. I use it to test whether learners, who pass through our research institute, have picked any information along the way. Wow Kevin, that looks sooo nice! and it works so flawlessly. Thanks for sharing! Wonderful job. Just added a couple questions. SO easy to use. Gonna' save a lot of us a LOT of time. Tx for being so generous and sharing. I'm glad everyone likes it! I've got another review game in development now (teaser: it's hockey related). I'll post a template once the design is complete. Great job and it looks like a lot of hard work! If I wanted to change the column titles how do i do this? Great Game! Works quite wonderfully. @Dustin Looks like you change the default value of the variables. One thing I was thinking about was a way to change the character to a learner-selected avatar. Any ideas? @Jennifer- You can create a character selection by using a variable. There were posts in the past about how to do it, but I was having a hard time finding one that explained it. 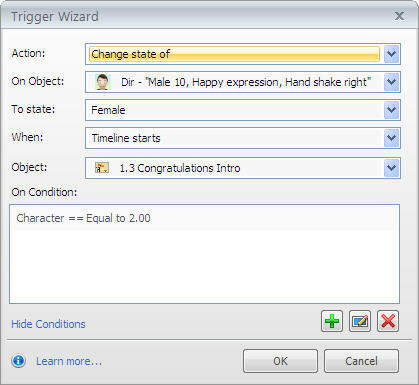 Basically you assign a variable to each character, then in future slides depending upon the initial selection you change the state of the character. 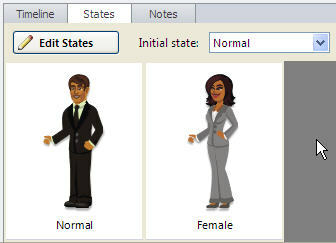 In this example, the male character= 1 and the female = 2. Hope that helps, if anybody can find one of those original posts, it might be more helpful. I believe they had a screenr showing the breakdown of those steps. Hi Kevin, thanks so much for sharing the template! I'm relatively new to Storyline, so I wonder where to and how I can make changes to questions and answer options. I imported the template to Storyline and can see the main screen with boxes and points. Is it possible to make this into a test/quiz where results are posted on the quiz results and if the user fails they are taking back to another slide for remediation? Create a button on the results screen, something to the effect of "continue to course review." Set the button's initial state to "hidden." When the user clicks the button, it then takes them to the first slide of the remediation that you have built. Great idea, something I will definately be adding in the future. Let me know if you have trouble executing it and I'll try and post an updated game when I have a chance. Hi guys! This template appears to be no longer available. Is there an updated link for this game that I could use? will send a link to one tomorrow. poll the audience" features? as well as "A minute to win it"
You can simply edit question categories, questions and answers. I use current show with high school learners who visit our research centre. Each question (challenge) ends with a video clip or practical demo of answer. You can alter it to suit your environment. I have a question: if I put your game (jeopardy) on the website of one of my classes (I'm instructional designer at a university). It should therefore view the source (so your name, articulate storyline). But is that enough? "Hi Kathy will send a link to one tomorrow. I have added "Who want..."
"Hi Kevin thought I'd add fully developed Jeopardy game. Alter ever..."
"Hi Andre! Here are my thoughts for adding slides based on user perf..."